Innovative ideas often emerge from the things we enjoy doing most. For Jennifer Hurst, professor of health and exercise science, that idea emerged from her love of America’s national parks. This summer, Hurst will translate that love of parks into TruAdventure, a travel education program sponsored by the Truman Institute. On campus, Hurst’s passion for national parks has translated into courses and student excursions at Yellowstone, the Grant Tetons and the parks surrounding Moab, Utah – Arches and Canyonlands. In early 2011, Hurst approached Kevin Minch, Truman Institute director, about the idea of translating a popular student trip she co-lead with colleagues in the Health and Exercise Sciences Department, into an exciting program for adult learners. The June 9-16, 2012, adventure begins when participants converge on Denver, Colo., for a Saturday night stay and Sunday morning departure by motor coach to Moab, Utah, where they spend two days and three nights visiting the sites surrounding Arches and Canyonlands national parks. On Wednesday, participants arrive in the Cortez, Colo., area where they explore the Anasazi Heritage Center, the Lowry Pueblo Ruins, and the Howenweep National Monument. Thursday, the tour continues to the Ute Mountain Tribal Park before transitioning to Salida, Colo. Friday morning adventurers arrive in Buena Vista, Colo., for a refreshing whitewater rafting adventure on the Arkansas River. The journey concludes in Denver. Unlike traditional tours, however, the buses only get participants to the parks, the rest is on foot. The trip will be of added interest to those who love geology and history. Arches National Park, known for its more than 2,000 natural sandstone arches, represents one of the most intriguing examples of the forces of nature at work on a landscape. Canyonlands, whose name only partially conveys its character, is home to impressive buttes, deep canyons and bizarre needle-like formations. At Anasazi Heritage Center, Howenweep National Monument and Ute Mountain Tribal Park, visitors step into the distant past and explore the dwellings of Puebloan culture much as they were hundreds of years ago. For those who like a refreshing dip in the water, the trip is capped-off with an exhilarating whitewater ride down the Arkansas River. Participation in the program is limited to those aged 21 and over. All overnight accommodations are in local hotels. Daytime meals are provided. The package cost of the program is $1,500, double-occupancy, for those registering before March 1, 2012. Single-occupancy rates are available. For more information, participants can visit the program website at institute.truman.edu and select the TruAdventure link, or call 785.5406 to request a brochure. Jennifer Hurst, professor of health and exercise science, will host an informational meeting about this year’s summer excursion course to Yellowstone and Grand Tetons nationals parks at 7 p.m. Feb. 7 in Pershing Building 3102. 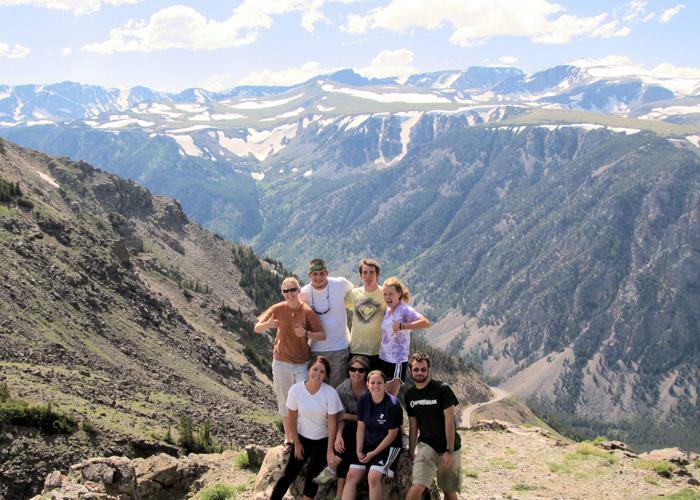 Truman students stop for a picture near Beartooth Pass in Montana before reaching the northeast entrance to Yellowstone National Park during the 2011 summer excursion. Pictured, top row, left to right: Kelly Ferguson, Richie Schumacher, Brendan O’Brien and Katie Shannon. Bottom row, left to right: Madison Bray, Taylor Wilson, Carmen Holahan and Scott Nelson. Offered last summer for the first time, Physical Activity and the National Parks has been modified and expanded this summer to an eight-week hybrid course for summer 2012. A combination of online learning for the first five weeks and a longer 14-day excursion trip will give students an opportunity to learn and explore two of the most unique environments on earth. Students will learn about the national park system, as well as the unique biology, geology, history and conservation issues connected to both Yellowstone and Grand Tetons national parks through different physical activities. Through hiking, wildlife observation, whitewater rafting and one day of beginning rock-climbing instruction, students will get hands-on learning about the parks’ fascinating features. Questions may be directed to Hurst at jhurst@truman.edu or call 785.4464. Anyone is eligible to enroll in the course. 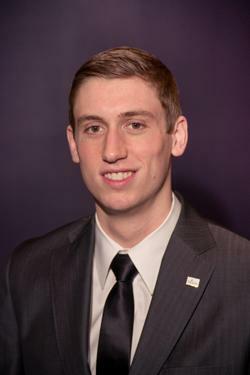 Michael J. Bushur, a sophomore psychology and economics double major from Lee’s Summit, Mo., was appointed as the student representative to the Truman Board of Governors by Gov. Jay Nixon Jan. 3. His appointment was confirmed by the Missouri Senate on Feb. 1. Bushur is a member of Phi Sigma Pi Honor Fraternity, the University Conduct Board and the Funds Allotment Council. Registration is now open for the University Conference taking place Feb. 16. The day is devoted to the personal and professional growth and enrichment of all members of the Truman community, including students. Attendees will find a wide variety of topics including, but not limited to: navigating the hidden job market; strategies for studying smarter; how to build a strong team in student organizations; and quitting smoking. Visit provost.truman.edu/University_Conference/conference_agenda.asp to register and view the complete schedule of sessions. To help facilitators prepare, it is required for interested attendees to register for each session they plan to attend. Over the lunch hour, the new TruView prototype and new mobile computing applications will be unveiled. Those interested must register for lunch as well. Truman, in partnership with Rave Wireless, now offers an emergency email and text messaging service to students, faculty and staff. This service will only be used in the event of an on-campus emergency, an unscheduled University closing or a delay or cancellation of classes due to, for example, severe inclement weather. The new Rave Wireless system is an improvement over the previous Truman system with additional features and services. Rave supports more carriers and provides better email options, as well as faster text messaging services. Students, faculty and staff who are previously signed up for the Emergency Notification System are automatically transferred into the new system. Those not previously signed up may add the new service. There is no charge for signing up, but standard text messaging rates apply. To sign up, log into TruView and enter/update emergency text messaging information on the “My Personal Information” channel. Detours Magazine, Truman’s student-produced travel magazine, will be hosting its biannual photo contest, themed “Show Your Spirit.” The contest is free and open to all amateur photographers. All entries must be submitted by Feb. 10 with location of the photo, the photographer’s name and contact information and a short caption. Two contest winners will be featured in the Summer 2012 issue; one selected by the magazine’s editors and one by Detour Magazine’s Facebook fans. There will also be at least four honorable mentions. Detours Magazine is a biannual travel magazine produced by Truman students. It focuses on the tri-state area of Missouri, Iowa and Illinois. In March 2010, the magazine received the Apple Award for best general interest magazine by the College Media Advisers. To see the full rules and regulations, visit www.detoursmagazine.com. Submit photos to photo@detoursmagazine.com or mail to Detours Magazine, 100 E. Normal, Kirksville, MO 32501. The winners will be notified in February. The “Ready, Set, Click!” workshop will be under way Feb. 13-March 30 to provide information and practice on the strategies for successful online teaching and learning. This workshop, presented by the Learning Technologies Team, will be helpful in identifying those issues that make the online classroom different and how to address them in ways to set up both professors and students for a successful Truman experience. It will serve as a great tool if instructors are preparing to teach a fully online course, or just wishing to “blend” or “hybridize” a traditional course. “Ready, Set, Click!” is one of three options that meet the provost’s requirement for online certification, which must be met in order to teach a fully online course. The workshop will be taught exclusively online, but there will be open hours for Blackboard training from 9:30-11:30 a.m. the first Wednesday and Thursday of each month in McClain Hall 215. Sign up for the workshop at eventmanager.truman.edu/register.asp?classid=800&sectionid=1764. For questions about the workshop, contact the Learning Technologies Team at ltt@truman.edu. Questions about the online certification process can be presented to the Office of the Provost at provost@truman.edu. During each week, the workshop will have some elements of asynchronous, but interactive, collaborative activities which will involve the whole workshop cohort. Other than these collaborative activities, participants will be able to proceed through the materials at their own pace. Unlike previous iterations of this workshop, there will not be built-in time to build or redesign an actual course during the course of the workshop. It is Career Week this week! Check out the great events taking place all week or go to career.truman.edu for more information. To see a full list of employers and grad schools coming to campus, go to truman.experience.com. The Volunteer Fair, an effort to connect student volunteers and community agencies, will take place from 10 a.m.-12 p.m. Feb. 9 in the Student Union Building Hub. The fair, sponsored by the SERVE Center, the Career Center and SOAN 265, will be an opportunity for Truman students to learn more about the needs and services in the Kirksville area, and for community agencies to recruit volunteers to improve or enhance their service efforts. Tru-Positions provides a comprehensive database of scholarship, institutional and work-study positions, including job descriptions and transferable work skills. This is an important advancement over the current process of requiring students to independently locate a student employment or service position. Tru-Positions will be updated as positions become available. Tru-Positions can be found online at trupositions.truman.edu. Instructions for viewing and applying for a position can be found under the student information section. Any questions or feedback can be directed to Financial Aid at finaid@truman.edu. 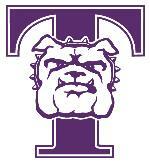 Truman State University Foundation Scholarship applications are now available. Approximately $250,000 is being advertised and will be awarded to current Truman students for the 2012-2013 academic year. All containers should be emptied and washed out. An exhibit featuring the 44 presidents of the United States is currently on display in the Library Gallery. The exhibit includes Lincoln items that are part of the Lincoln Schwengel Collection and past winners of the annual Lincoln contest. The display will be available until the end of February. Taner Edis, professor of physics, will present “Creation v. Evolution: The Muslim Debate” Feb. 9 at Trinity University as part of that school’s Darwin Week. Marie Orton, professor of Italian, recently had two articles accepted for publication. “Telling Uneasiness: Second-generation Migrant Writers in Italy,” came out in January in Italian Cultural Studies (University of Bristol) and “Writing the Nation” will be published in March in Italian Culture. Truman’s Art of Living Club will once again offer the Art of Living course Feb. 10-Feb. 13. Anyone interested may attend an informational meeting at 7 p.m. Feb. 7 or Feb. 8 in Baldwin 349. Contact Lloyd Pflueger at lloyd@truman.edu with questions. The Spring Career Expo will be 12-4 p.m. Feb. 8 in the Student Union Building. This is part of Career Week, sponsored by the Career Center. Truman will be conducting a public auction of surplus equipment and furniture at 9 a.m. Feb. 11 at the Dulaney-Baldwin Building. The Habitat for Humanity Dodgeball Tournament will be take place from 6-9 p.m. Feb. 12 in the Pershing Small Gym.